There is a lot to be said for carefully planned lessons that are steeped in pedagogy and geared tightly toward desired learning outcomes. Yet sometimes we forget that prior knowledge, our new learning starting line, is a broad astroid field of loosely related thoughts. We have a great understanding of how to guide students once they get thinking but the trick is to get them thinking in the first place. I left it broad. Just tell a story based on what you see. For some, they knew the story being told here. For some, this was their first experience. Essentially this was the history of Israel from the map’s perspective. 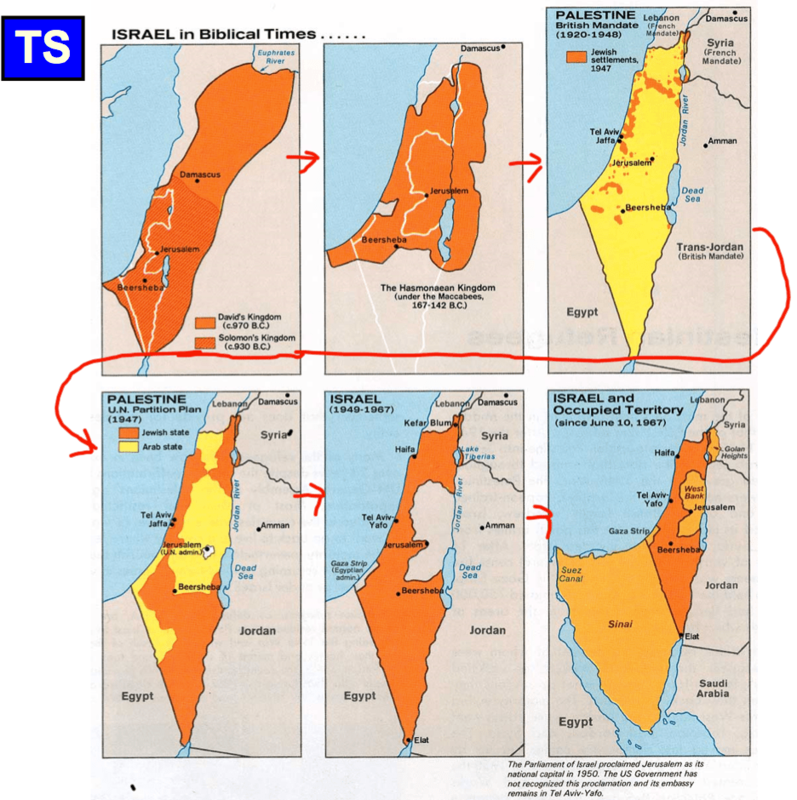 Many students were able to use their prior knowledge of maps and what causes country boarders to change to infer many important aspects of the story (eg, the orange and yellow are two different groups, they are fighting over Palestine/Israel). Mission accomplished. We’re ready to fill in the details. 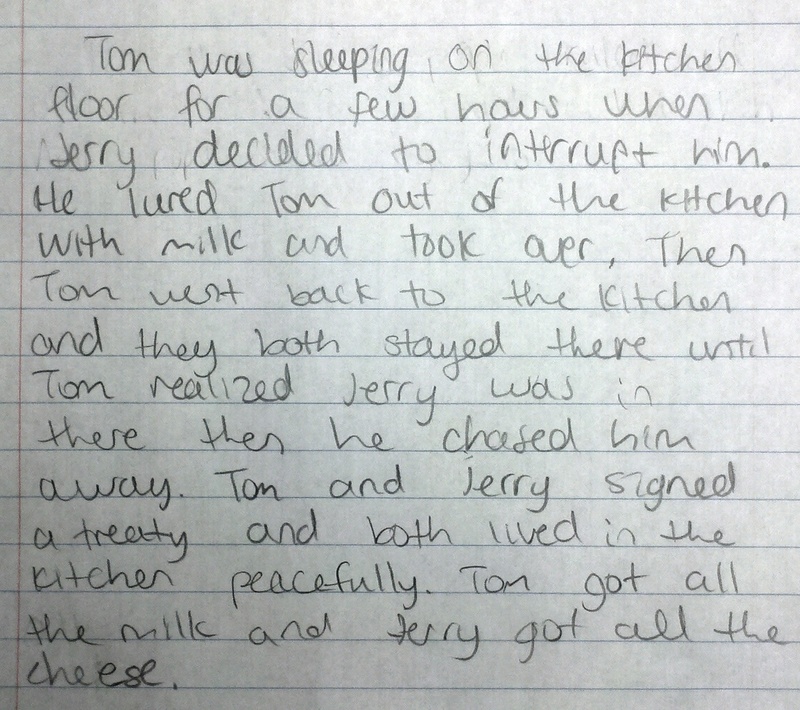 Tom was sleeping on the kitchen floor for a few hours when Jerry decided to interrupt him. He lured Tom out of the kitchen with milk and took over. Then Tom went back to the kitchen and they both stayed there until Tom realized Jerry was in there, then he chased him away. Tom and Jerry signed a treaty and both lived in the kitchen peacefully. Tom got all the milk and Jerry got all the cheese. It first seemed to me that this student was very knowledgeable about the history of Palestine/Israel and decided to create an Allegory to demonstrate this knowledge (perhaps being satirical about the ‘peaceful’ part? 🙂 ). To my surprise, this student knew nothing of the history. Instead the student used strictly the map’s changing borders and colors as inspiration for the story. What I can tell you is that I get one or two of these every time I do a thought starter that connects to new learning in a broad way. I reassure them that there is no right or wrong answer and they go on to do these great works of art that come to symbolize the starting point for their new learning. It’s amazing and I’m fortunate to take part in these accomplishments with them. Is this what I can expect from all my students? Absolutely not. But I do know that this creativity was allowed to blossom because I invited it. Real differentiation isn’t in giving students choices, it’s giving them the freedom to construct their own thinking. Raw, passionate, artistic, deep learning.